4 course dinner and drinks. 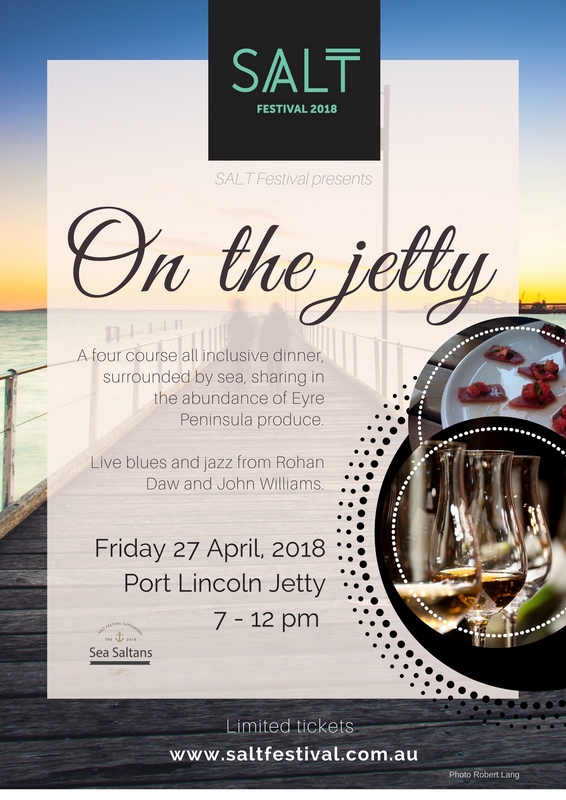 As the sun sinks, and the candles and fairy lights reflect across the water, take a stroll down the jetty and join us for ’On The Jetty’ Port Lincoln’s very first jetty dinner party. You’ll be granted exclusive access – the jetty is all yours for one night only. Perched over Boston Bay the evening will begin gathered around the ultimate gin and tuna bar to experience sashimi perfection. Guests will then be asked to take their places at our long table, as our chef draws inspiration from the surrounding sea and fertile Eyre Peninsula farmland. This scrumptious evening will be a sharing of abundant gourmet platters, premium local wines & craft beer, enchanting live jazz & blues, and your delightful company. Memories will be made, and souls will be enchanted as we join together under the stars and over the ocean for this magical event.